You’ve probably heard about how the new WordPress Gutenberg editor brings block-based editing to WordPress. So…is it? Should we call the funeral home and start the preparations? Well, first off, it’s important to point out that there’s a big difference between wanting PHP to be dead and PHP actually being dead. Looking for ways to improve your WordPress development workflow? 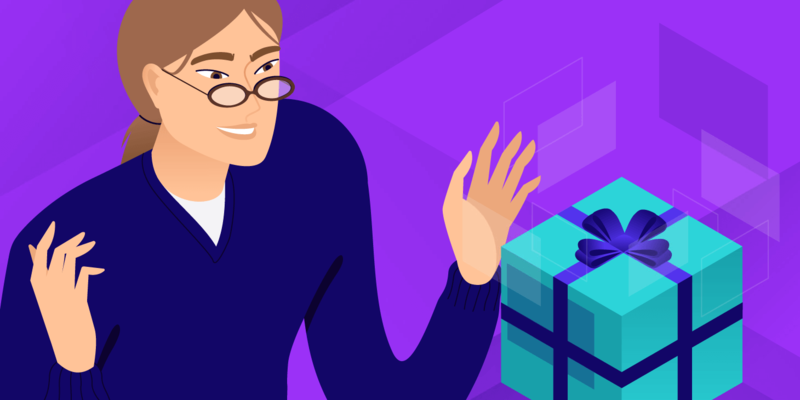 Kinsta’s hosting solution was built by developers for developers. 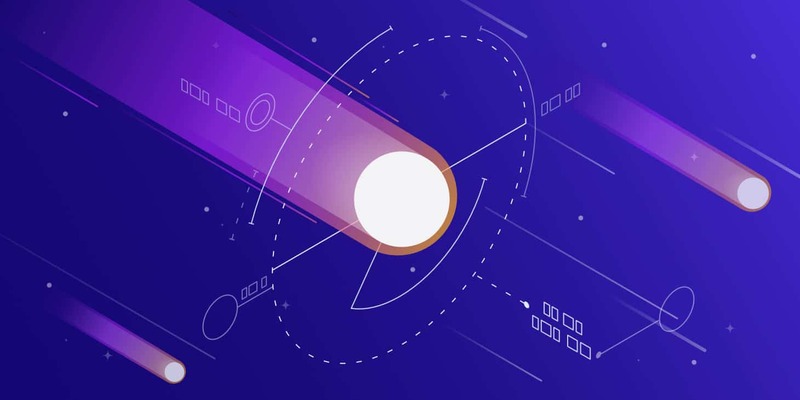 Git, PHP 7, SSH, and WP-CLI, along with powerful staging and cloning environments gives you the tools you need to build sites faster! In this post, we’ll dig into the data and show how PHP isn’t close to being dead (even if you really wish it were). First off, let’s look at what W3Techs has to say. To be fair, that number is declining. In November 2017, W3Techs had PHP as the server-side language for 80.1% of websites. That number dropped to 79.6% in June 2018, and now it’s down to 78.9% when we’re publishing this post in November 2018. However, you also have to take some of the statistics with a grain of salt. Some of these scanning tools simply look for the X-Powered-By HTTP header. Some hosting providers, including Kinsta, remove these headers from broadcasting on the server for security purposes. Therefore, the number of sites using PHP could, in fact, be higher. But when the number is still over 75%, it’s tough to use that decline to pronounce PHP as dead. These numbers really shouldn’t be surprising if you think about it. First off, WordPress, the most popular content management system in existence, uses PHP. 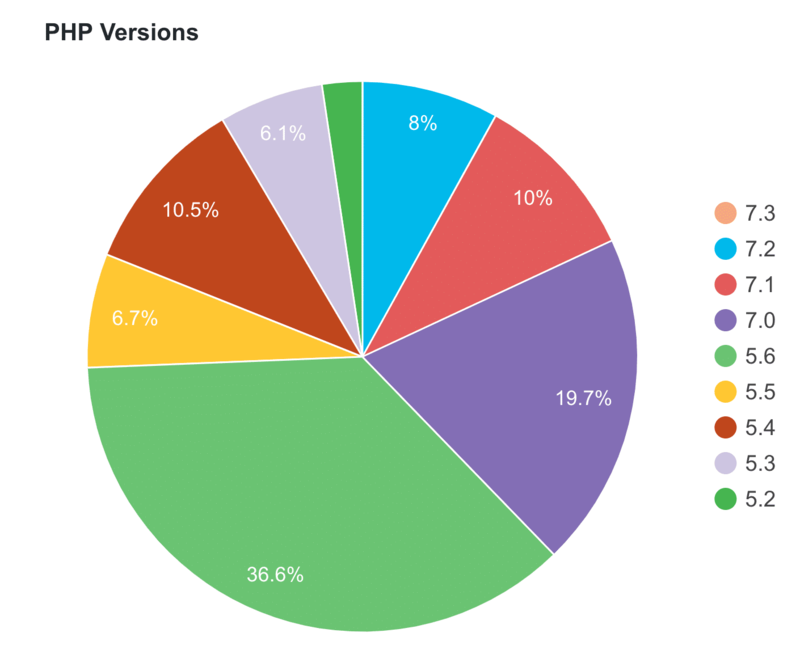 Given that WordPress powers over 32% of all the websites on the Internet, that’s a lot of sites using PHP right there. But it’s not just WordPress, either. There are tons of other big and small sites built with PHP. For example, MediaWiki, the software behind Wikipedia, is written in PHP. And oh yeah, both Drupal and Joomla use PHP, too. With the latest versions of PHP, PHP is faster than ever. Our recent PHP benchmarks show a huge performance increase for PHP 7.X over PHP 5.6. 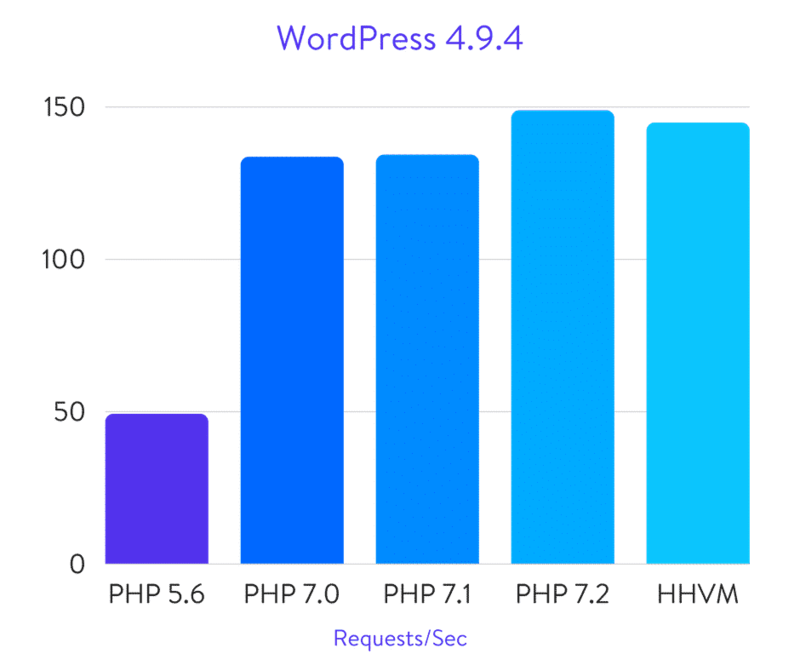 In our tests using WordPress and popular eCommerce plugins like WooCommerce and Easy Digital Downloads, PHP 7.2 was pushing 2-3x the number of requests per second as PHP 5.6. Better yet, PHP 7 also stacks up favorably against other languages, as well. Of course, you’ll only notice these improvements if you’re actually using the latest version of PHP. Unfortunately, that’s often not the case. PHP versions 7.0 and under no longer receive active support and will lose security support at the end of 2018. The fact that so many websites are running on a PHP version that’s officially reached its end of life probably doesn’t help PHP’s reputation with developers. Read this post if you’re still not sure why you need to update your PHP version. Because of PHP’s popularity, it’s easy to find PHP developers. And not just PHP developers – but PHP developers with experience. 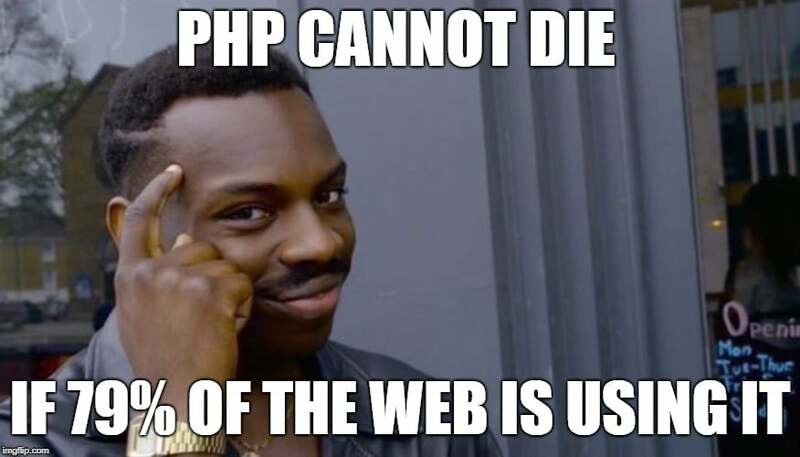 If PHP is dead someone forgot to tell my bank account. For newer frameworks, it’s harder to find developers, especially ones with experience. More importantly, sometimes experience just flat out isn’t possible without a time machine. For a humorous take on it, there’s this Reddit post where a job description wanted a React developer with 5 years of experience back in 2017, at which point React had only been around for ~4 years. There are only two kinds of languages: the ones people complain about and the ones nobody uses. Yes, PHP does seem to be losing some steam according to W3Techs’ data. But even if PHP keeps decreasing at the same rate, it would take 25+ years before PHP even dropped under the 50% mark! What do you think? Is PHP dead? Do you love PHP? Do you wish you could smother PHP with a pillow? Let us know in the comments! If people think because a language is modern, it means it’s good, so they are wrong. I’m a senior PHP developer, I have years of experience in it, I can talk in PHP easier than my native language. I know PHP isn’t dead but it makes me worried about my career, you should be worried too. You should know that nearly no new big company start their big app in PHP, for you as a developer it means less opportunity to work in professional companies. The other concern is that you will get far less salary in compare to other developers/programmers, because it’s so easy to get highly experienced PHP developers everywhere with low salary demand. My suggestion to who read this far is to keep their knowledge of PHP as it’s quite valuable and PHP isn’t going to die but go learn about Go and/or Node.js. Does it really speaks by itself that hosting providers, including Kinsta, remove headers that identify PHP servers? I’s obvious that over 75% of the web is insecure just for the fact of using PHP. So the question is not ‘is PHP dead’ but ‘please, turn surgery off, cut off this tubes and let the patient rest in peace’. PHP will never be secure by desigh, because author of PHP invnted PHP language occasionally, it is actual a scripting extensions over OS API, so it is not designed with security in mind, totally. This differs new wave of languages like .NET Core and Java, which actually designed with security concerns, so yes, they are difficult to master, difficult to support, difficult to develop, but, by design, are more secure to use in server-side development compared to PHP and sometimes even faster, more performant and flexible than PHP. You are talking about PHP3 that it was -err- amateur. PHP4 was a large improvement, but PHP5 was a totally different beast: object are finally first citizen, hierarchy, etc. PHP6 was a dark page that no-one want to talk about. 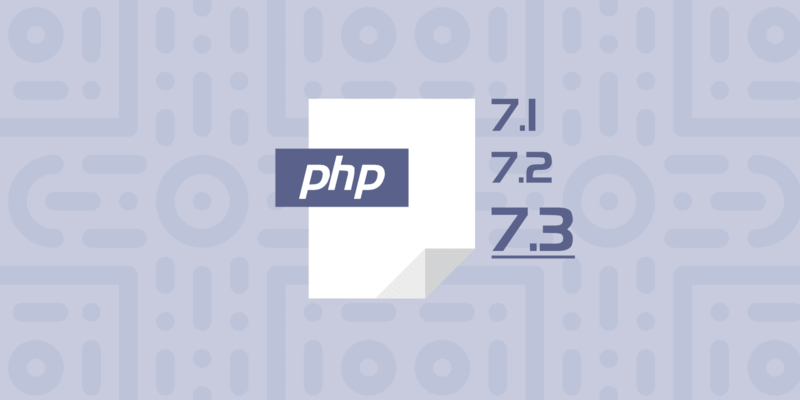 And PHP7 is a huge step forward: closure, reflection, typed strict check, and so on; all the missing features are in, and now we can talk to features parity with other languages. PHP is inconsistent for his legacy, but it’s mature and flexible. If people that write articles cared more about writing great material like you, more readers would read their content. It’s refreshing to find such original content in an otherwise copy-cat world. Thank you so much.